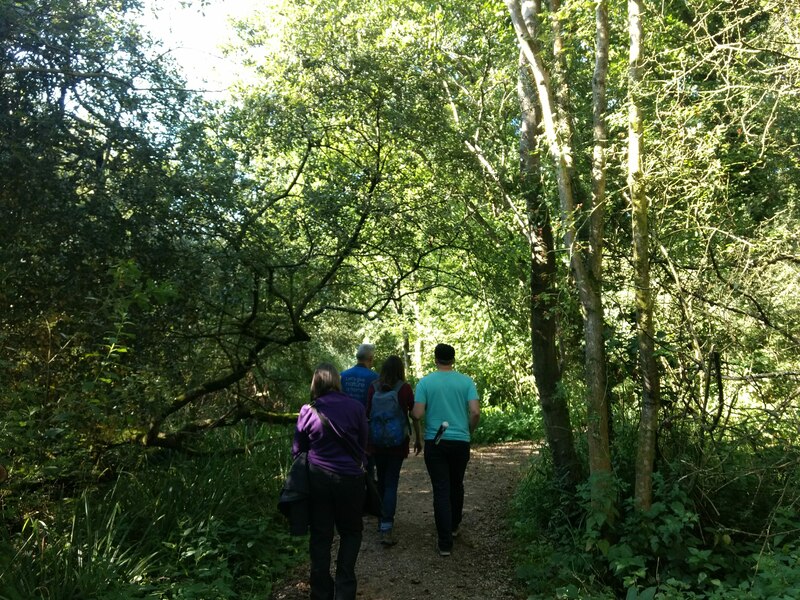 The Nature Narratives project team walk down a path bisecting a verdant reed bed, at Leighton Moss RSPB reserve. It is a bright, sunny day and the sky is clear and blue. VocalEyes are partners on a pioneering project with the University of Exeter titled Nature Narratives: Vocalising Nature Sense. Our Museums, Galleries & Heritage Programme Manager, Anna Fineman, spoke about the project at the Sensing Nature conference at the Wellcome Collection on 30 October 2018. This is an adaptation of the presentation. The scope of venues we work with across VocalEyes’ Museums, Galleries and Heritage Programme is extremely broad – including contemporary art galleries, national museums, historic ships and castles. However, to date, they have in the main, been cultural heritage venues. Whilst many of these have outdoor elements in the form of gardens or grounds, the focus has generally been on the built, created, and tangible aspects. I was approached by Dr Sarah Bell who is a Research Fellow at the European Centre for Environment and Human Health, based at the University of Exeter. Sarah has been researching the links between health, wellbeing and nature for a number of years. Her current project, Sensing Nature, is specifically exploring the experience of nature by people with sight loss, and how more inclusive opportunities to enjoy the natural world can be promoted. The project is supported by the Economic and Social Research Council. 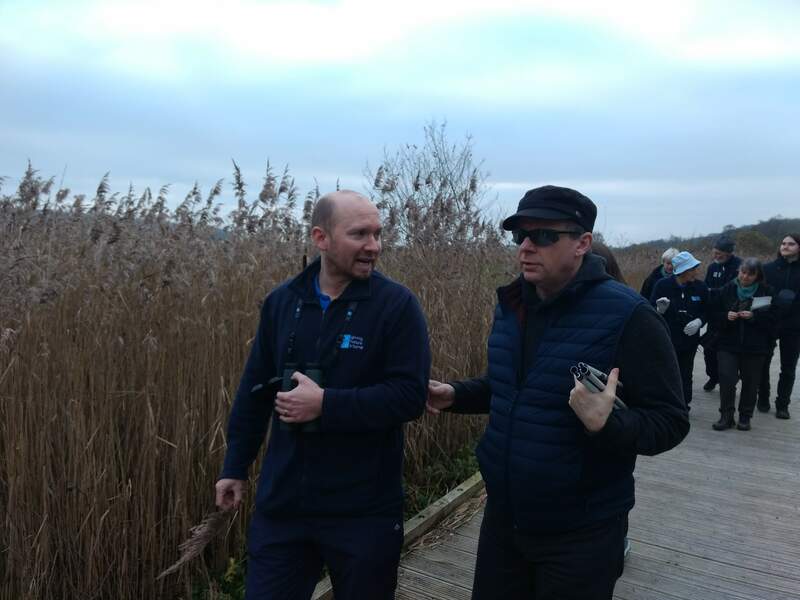 Sarah contacted me following the very successful completion of part one of her study, which included a series of in-depth interviews with visually impaired people, regarding their experiences of the natural world, and an exploratory workshop at WWT site Slimbridge Wetland Centre. You can read more about this work on the Sensing Nature website. Sarah explained her ideas for stage two – to train staff at public nature sites, equipping them with skills and knowledge of audio description and visual awareness, so that they may support inclusive, outdoor visitor experiences. It was clear that we held many shared aims. I am passionate about the impact of being outdoors on wellbeing, and this seemed a natural progression for VocalEyes, to use our skills and experience in audio description, and working with people with sight loss, to begin working with natural heritage sites. We were delighted to become project partners on Nature Narratives: Vocalising Nature Sense. 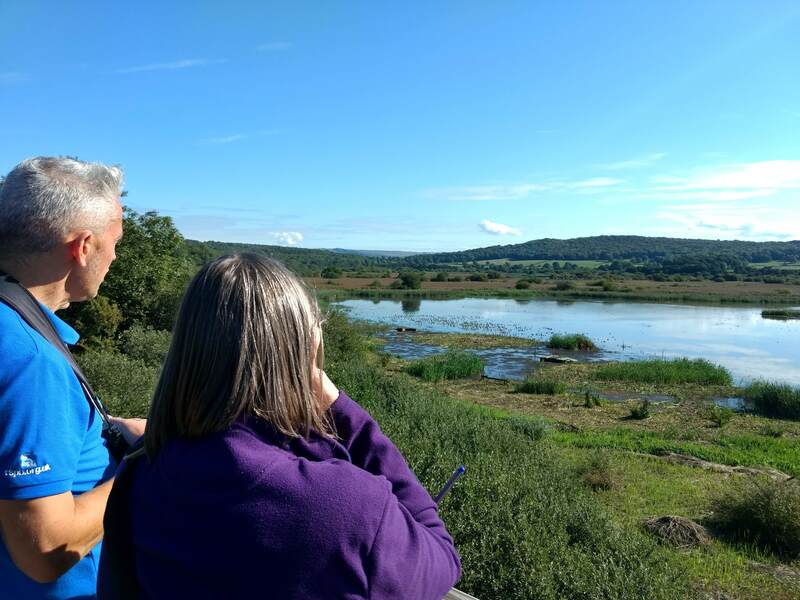 Leighton Moss Visitor Experience Manager Jon Carter and VocalEyes Visual Awareness Trainer Sally Booth view the expansive reed beds at Leighton Moss, from the top level platform of the Skytower. Green reeds surround a body of water, and forested hills are visible in the distance. Sherwood Forest in Nottinghamshire, also an RSPB site. The team includes audio describer Lonny Evans and visual awareness trainer Sally Booth from VocalEyes, Andy Shipley, an independent coach interested in sensory exploration, Sarah Bell, and the partner venues. We completed preliminary site visits to each venue during September and October, in order to design a two-day training course – this will be tailored to each site, but needs to be broadly appropriate for the diversity that natural heritage sites comprises. To be immersed in the elements, and the expert knowledge of the site staff was incredibly inspiring, compelling us to enable people with sight loss to have equal access to such stimulating opportunities. The three training courses are taking place during November. Alongside, we are developing a written manual to support staff in developing their inclusive practice and audio-descriptive techniques. This can be referred to by the trainees following the courses, and be used more broadly to introduce the approach to colleagues who did not attend the courses. Leighton Moss Visitor Operations Manager Kevin Kelly guides Andy Shipley along a wooden boardwalk through a reed bed at Leighton Moss. ‘He is passionate about the natural world, and spends much of his free time in the natural environment, walking and bird watching. Although he is unable to see the birds, Wayne identifies them by listening to their individual songs. Although he now lives in London, Wayne regards frequent visits to the countryside as vital to his health and sense of wellbeing, and makes every effort to visit frequently.’ Wayne Chapman, who was blind from birth. However, despite the wish, and in some cases more of a need to spend time in nature, looking at the broader picture it seems that to date public outdoor sites are not considered as accessible as other places people may choose to visit in their free time. The landmark Making Connections study by the Sensory Trust (2001) was rooted in the concern that areas of public green space across the UK were failing to meet the needs of disabled people. Within Natural England’s A Sense of Freedom report, all the people within the case studies detailed how multiple barriers – attitudinal, physical, social, sensorial – were present at outdoor sites, leading Natural England to conclude: ‘Disabled people do not always have the same opportunities to experience and enjoy the natural environment that many of us may take for granted.’ That was in 2008, and 9 years later, the 2017 Euan’s Guide Access Survey revealed that accessibility of outdoor sites was rated lower than that of museums, theatres, cinemas, music or sports venues. 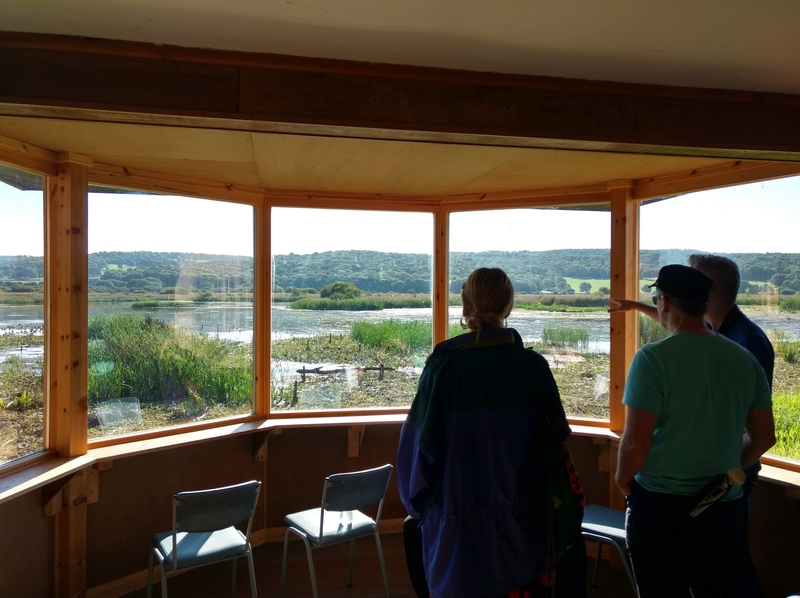 The Nature Narratives project team survey the reed bed at Leighton Moss from a bird hide. In many ways natural heritage sites actually seem like more obvious places for blind and partially sighted people to visit and enjoy; so why the apparent gap in accessibility? I wondered whether this might partly be rooted in a sighted perspective: concerns that the environment cannot be controlled; the inability to curate or deliver an experience; underestimating the ability of people with sight loss to be able to navigate and enjoy a changing environment. I think assumptions can be made that some places are inherently inaccessible, and that blind and partially sighted people will not visit – and as a result resources and programming for this audience are not developed, and they are not considered or addressed in marketing. RNIB’s My Voice report (2015) found that half of blind and partially sighted respondents said that they were always or frequently limited in the leisure activities that they would like to take part in. This suggests that despite a will and desire on their side, external barriers were preventing them from participating in activities. Furthermore, RNIB recently released the headline research finding that the biggest barrier facing blind and partially sighted people is the lack of knowledge and understanding of sight loss and outdated attitudes of the people around them. Incorrect assumptions and stereotypes persist and are felt to be the greatest obstacle to social inclusion. If outdoor sites do not think blind and partially sighted people are able to enjoy their environment they will not be communicating a welcome to people with sight loss. As a result, if blind and partially sighted people are not given recognition and reassurance that they will be supported at a venue, they will not visit. The Nature Narratives project team walk away along a gravel path, surrounded by a canopy of trees in green leaf. I think it is a process of education to help change perceptions, building on the excellent work that is already taking place in this area – we can support staff of natural heritage sites to support their blind and partially sighted visitors. To reframe the supposed challenges of outdoor sites as positives could be helpful in understanding the opportunities natural heritage sites offer people with sight loss. You cannot curate the experience, so let’s reject the hierarchical notion of certain people delivering to other people, and instead develop inclusive practice – group experiences that are not visually-led, and open to contribution and dialogue. People with sight loss have the right to actively participate in and influence their experiences. Outdoor sites are naturally inclusive environments. As previously discussed, so much is experienced non-visually. All visitors need support in spotting species, having landscape changes pointed out, regardless of their level of sight. It can be a levelling experience. Outdoor sites can offer a sense of freedom for all from the built environment and associated protocols. We can support natural heritage sites to avoid making assumptions about blind and partially sighted people, in terms of the extent to which the environment needs to be controlled, but to consult – seek opinions and guidance from the visitors themselves. Safety is the aspect to manage (and this is very important, for all visitors), but visitors can make their own decisions as to whether something is inaccessible or not – provide information and support and let them choose their experience. 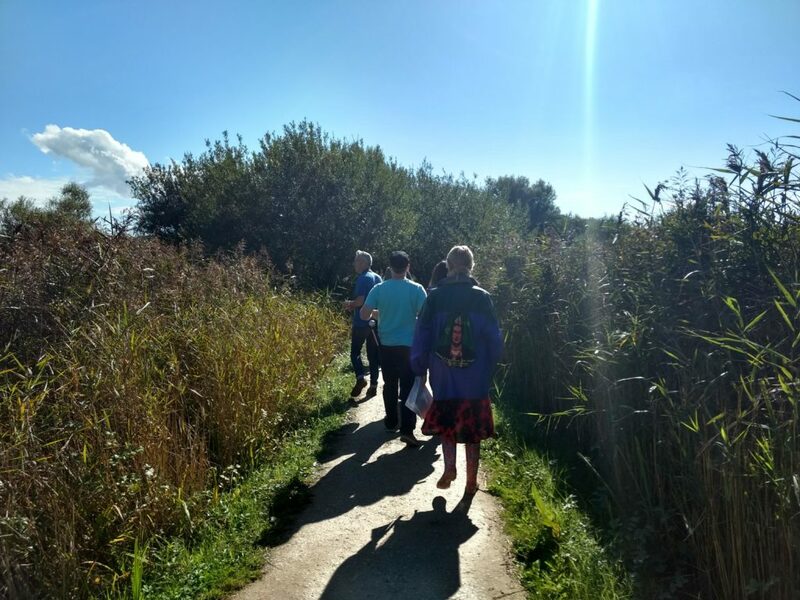 Increasing the understanding and skills amongst staff can lead to increased confidence amongst blind and partially sighted people to visit natural heritage sites. This is exactly what we are aiming to do with this project – give those with the passion for the environment and knowledge of their site the audio description and visual awareness skills, in order to include blind and partially sighted people. Following this pilot with three sites, we very much hope there will be uptake from further venues, and importantly a broader shift in understanding and practice from the overarching organisations responsible for managing them. In this way we can really open up the UK’s incredible natural heritage and create equality of opportunity for blind and partially sighted people.